Brent shares credit with Connor for Soundflower, Al on International Mac Podcast at impodcast.tv. On Dumb Question Corner Jim asks why Quicksilver if we have Spotlight, and Jane asks how to make a text file of the list of files in a folder on OSX. Ron David launches his podcast at The Sounds of Wings at thesoundsofwings.com. Maccraic’s Justin G Byrne and David Shortle join me for some fun with Honda Bob maccraic.com. I try and try and try to put Ubuntu on my OLPC but don’t succeed, yet. Connor writes two automator scripts to help me turn network time syncing on and off before using Skype. In Chit Chat Across the Pond Bart and I talk about how he found Pages useful, and we talk about bad journalism on the net. If you’re at MacWorld next week, check out the live Mac Roundtable at 4pm on Wednesday in the Macworld Learning Center Booth (# 3036) in North Hall. Today is Sunday January 4th, 2009, and this is show number 185. Remember last week when I said I owed my success finally piping the audio from Garageband into the live stream over on Ustream to BJ constantly reminding me to try Soundflower? Well it turns out that even before BJ had started harrassing me on that idea, Brent Cameron (aka trucklover on Twitter) had started bugging me about it too! I completely forgot how many times I forgot to try out this ever so simple solution! I’m sure Brent told me because he remembers me writing it down each week he said it, and I know I’ve thrown out about 23 pieces of scrap paper with the word Soundflower on it! So I hereby split the Nobel Prize in Allison nagging to use Soundflower to Brent and BJ. Last week was episode 36 of the International Mac Podcast and i had the great pleasure of being invited to join in as a guest. Ok, so technically I asked them if I could join in, but they DID say I had an open invitation! We had great fun in there with Stu, Bart, Will, and Michael King. They do a news show which left me a bit handicapped since of course I didn’t read any of the articles ahead of time, but they were good sports and let me just chime in when I had an opinion or something sarcastic to say. I think my favorite part was when Will brought up the article about Apple taking into account leap seconds. You’ll have to listen to the show to find out why that was funny! Go check out the show at impodcast.tv. Hi Allison! I was a Windows user since there was such a thing and a computer user since 1978 and hated Macs. Every time I had to do tech support in the company where I worked there would always be someone with a Mac saying how much better it was and that a PC couldn’t do the same. Well, yes it can – it’s just a matter of preferences in Mac Photoshop vs. Win Photoshop. Of course, knowing nothing about Macs made support a nightmare and I could never find the settings I needed, it wasn’t pretty. Anyway, I got real curious lately and talked to a coworker that recently switched and he said “If you want to tinker – virus scans, hardware changes, etc.- get a Win PC. If you just want it to work – get a Mac.” I’ve been tinkering for 30 years so that sounded really appealing to just have a machine that works. In July I bought a beautiful 20″ iMac and even though it’s not top of the line I have never been happier. I have had a ton of stuff running and it hasn’t even slowed down! And the screen, so bright and beautiful. Best of all, I use Parallels and an XP install so I don’t have to repurchase any software that I have to have. So, back in July I subscribed to every Mac podcast I could find. Some were great and others were deleted as soon as I heard them. There aren’t many that survived… (in no particular order) Mike Potter @ For Mac Eyes Only, Victor @ Typical Mac User Podcast and this really helpful lady named Allison @ NosillaCast are the ones I regularly look forward to. There are a couple of others but they are reserved for when I have listened to the favorites first. Being new to the Mac world I am a little confused about something. Mac OS X has the spotlight that allows me to command-space and start typing something I want and magically it pops up as if it read my mind. One of the must-have utilities that’s always listed is QuickSilver which does much the same thing. My dumb question is “What secrets can you tell me about QuickSilver that has everyone still using it?” I’m sure there is a reason out there somewhere. Thanks for the information, podcast, and great attitude you have helping all us noobs! Now stop reading this email and get back to the next podcast! Well after I thanked him for his kind words, AND finally subscribed to the For Mac Eyes Only podcast, which I’d MEANT to subscribe to for ages, hearing GazMaz mention it so often on the Mac Reviewcast, but I reserve Tim’s show for when I’m running so by the time I get home I can’t remember half of what what I meant to look up later! 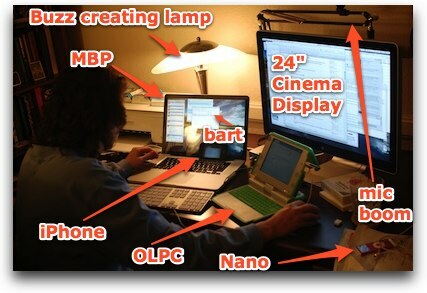 I loved Jim’s email and his path to the Mac being impeded by the Mac zealots. I admitted to him that I’m a zealot and I try SOOOOO hard not to be but it’s a trial. Ok, so let’s work on this supposedly dumb question. I liked the comparison of Quicksilver to Spotlight because Bart and I go back and forth on this debate frequently. I’ll TRY to represent the Spotlight fanboy perspective but to be honest I want to prove that QS is worth the trouble since that’s what I use! To be fair, I should mention that I can’t even represent the QS fanboys that well because I use so few features of the tool. I listen to people like Merlin Mann talk about all these “triggers” and stuff, essentially creating wild macros to cause all kinds of magic to happen. I primarily use QS for just few things. Let’s assume for the sake of argument that I’m a typical person not using all of the tools at my fingertips, and do the analysis from there. First things first – both tools are free. Quicksilver is available from blacktree.com and Spotlight comes built into Leopard. I think it was there before Leopard but I don’t think it was quite as capable early on. The biggest advantage Spotlight has over QuickSilver, according to Bart, is that since Spotlight is built in, it’s always there on every Mac on which he works. With the muscle memory built in, that IS a huge advantage. Let’s start with the most common usage of both tools – launching applications. Before I tested I came up with five applications at random to try in both tools. I’ll did Mail, Firefox, AppDelete, Safari and Twhirl. Spotlight is triggered by command-space, and I’ve sent QuickSilver to be triggered by control-space. I’ll try launching the apps from each method and judge each one on how many characters I have to type before I get the right tool available with a carriage return. Mail – 2 (Microsoft Word, which I haven’t yet launched on this computer), Firefox – 2 (again with Feeder), Appdelete – 2 (Adium took the bait here first too but not Aperture), Safari – 1, Twhirl was a complete failure on Spotlight. Entering T got iTunes of all things, and then as I entered more letters it sort of just froze up. It insisted on just giving me iTunes. About 3 or 4 places down on the list it showed me (after a LOOOONG lag) was Twhirl, but that didn’t fit my criteria of typing a few characters and then hitting a carriage return to launch it. If I have to READ what it’s doing and worse yet wait for it, then it’s a fail for me. So in the big countdown, for the apps they could both launch, it was a wash, but since Spotlight wouldn’t give me Twhirl at my fingertips, it has to lose the contest. The long lag is something I’ve experienced before and it completely defeats the purpose of a quick launcher if it isn’t quick! Another thing people (and even I) use QuickSilver for is looking up people inside Address Book. I can hit control-space and then type in Grant and a carriage return and up pops Address Book with my brother’s contact information open in Address book. Alternatively I can even avoid launching Address book at all – once I see that QuickSilver has come up with Grant’s name, I can hit the right arrow key and I see his home phone, cell phone, address. If I want to see it huge son the screen, I can even arrow down to any of these, then hit a carriage return and it comes up in large type on screen. With my short attention span, it’s not that uncommon for me to look up a number, turn to the phone, and it’s gone from my memory by the time I get to the phone! With QuickSilver I can see the darn number across the room! I couldn’t figure out any way to do any of this with Spotlight. I tried the same thing in Spotlight. The first time I searched on Grant it took a short second to find him, but once it did pop up, a quick Carriage return and I was able to launch his address in Address Book. I couldn’t however find a way to easily arrow down or over to his phone number for a quick lookup. That was unfortunate, but I DID get a bunch more information I wasn’t looking for. I got a dictionary lookup for Grant (to agree), I got a document about scholarships, two folders of pictures of Grant, a couple of emails, his birthday in iCal, some PDF files, even a couple of webpages and music that had Grant in them! Wow – that’s pretty helpful info if that was what I was looking for. As a way to get to his phone number quickly it’s good, missed on the large type, but sure got me more info if I really needed that! Here’s another win of QuickSilver over Spotlight. I had Address Book open already to my friend Katie’s address but it was behind some other windows so I didn’t notice it. 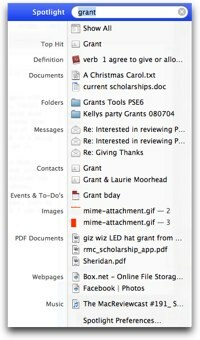 I tried again with Spotlight to type in Grant’s name, and when I hit the carriage return it brought Address Book to the front, but it didn’t have Grant’s name showing – it kept it at Katie’s! I tried the same thing with QuickSilver and it DID bring me to Grant’s name! Fail on Spotlight. One thing I’ll give Spotlight the point on above QuickSilver is that it’s easier to use the calculator with SL. All you do is launch SL, and type in 4+3 and automatically it puts in 7. No equals sign or any other triggers required. With QuickSilver you have to launch it, type =4+3 and then hit a carriage return, so that’s 2 extra keystrokes! Win for SL. I should explain that I love SL when it’s in the upper right of a Finder window – using it to find files and filter by date and type and all that is fantastic. I think the single thing that bugs me most about using Windows is that I can’t figure out how to do a reasonable search, and I miss SL for that every single day! Well Jim – was that a long enough answer to your question??? Bart explained that sl has to learn, and also suggested I mention that you can use a couple letters, like du is disk utility in both. Hi Allison – it’s Jane here in sunny Perth recording on a hot day of 38 celsius that’s 100 in the old Fahrenheit money. I have a very dumb question for you today. As i have mentioned numerous times on Twitter recently I will be getting a new MacBook Pro in January!!! Can you hear the excitement in my voice! Now I know there is a simple way to migrate all my existing settings and apps and well, just about everything over from my old MacBook Pro to the new one by using the very clever Migration assistant within the operating system, but I have always loved the process of doing this tedious job manually. You see if i just migrate everything over in one fell swoop, then the new laptop is going to look and feel just like the old one straight away, albeit a little faster and with a much bigger hard drive, oh yes, that bigger hard drive! Much of the pleasure of getting the new laptop is that it feels different, looks different, behaves differently to the old one, for a little while at least. So one of the things i’d like to do before i get my new laptop, is to go through all the 122 apps listed in my Applications Folder to remind myself what some of the lesser used apps actually do and then decide which ones to install on the new MacBook Pro and which to discard. Also to check if there are new versions of the apps and then, finally, tick off which ones i have installed on the new laptop. So Allison, after the long preamble here is my dumb question: How can i print out the list of apps in my Applications Folder? I tried screen capture using your favourite ScreenSteps and also the built in Mac OSX screen capture, but they only capture the visible part of the Finder window. I would really like to be able to save a list of the apps as a text file which i could then annotate and printout as and when required. You see, the list of apps is so long that even with the Finder window filling my screen I would need to capture 3 screen images to contain all the apps. Any suggestions to help solve my dumb question would be really appreciated. excellent recording as always! you’re going to giggle when you learn how to do this. I looked online and found a ton of really creative solutions using AppleScript and such nonsense, but I tried an easier way, and it worked! This week I got an email from my dear friend Ron David from rondavid.com. Ron is well known to you even if you haven’t ever heard his name – he’s the professional voice artist who has done such fabulous work as the Titanic episode on National Geographic and the series Wings of War on PBS. Go over to his site and give a listen, you’ll be sure to remember his voice. Anyway, in Ron’s email he told me that he FINALLY started a podcast! I’ve been begging him to do this forever, he’s got all these fantastic stories from the early pilots he loves to hang out with. You may remember that one year when I was on vacation I put up an interview he did with famous early pioneer in aviation Faye Wells. If you haven’t heard it, search on my site for it – it’s amazing. Anyway, His podcast is called The Sounds of Wings and you can find it at thesoundsofwings.com. He’s got several episodes up already and guarantee you’ll be mesmerized by his amazing story telling ability. After Ron sent me this I checked in iTunes to see if he’d posted the show there yet and he hadn’t so I asked him if he needed any help getting it up there. He said sure, so I thought, what better way to explain it than do it in ScreenSteps? I thought it would be a good experiment to explain how easy it is to make great documentation if I actually timed myself. I launched ScreenSteps, then ran through the steps on iTunes, taking snapshots of the screen along the way, then went back and wrote in the instructions for each step, made some annotations on the images, and then hit publish to my blog. The total process took 16 minutes! I found one little crop I didn’t like on one image, went back to ScreenSteps and fixed it, then hit publish again, and it just updated beautifully. My entire time from start to finish was an entire 21 minutes. I was shocked to discover that I had never covered this in Podcasting on Podcasting, so I published the text documentation as PoP #12. With any luck I’ll do an audio recording but for now the instructions are up on the site. If you’d like to be able to do this so easily and painlessly too, check it out at screensteps.com, and download the free trial. I just found out that you can even sign-up for a free 45-day trial of ScreenSteps Live at www.screenstepslive.com – no credit card required! Remember when you go to buy it after the trial, be sure to use the coupon code NOSILLA to get 25% off! 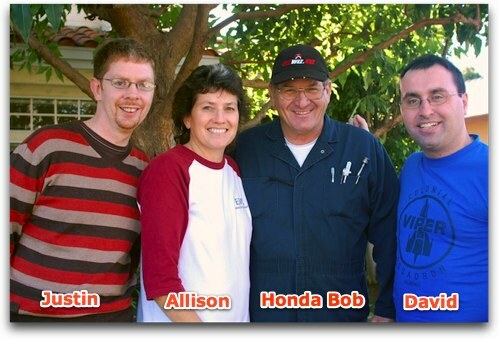 We had such a great time, they even got to meet Honda Bob, which was really fun. Honda Bob is an international superstar! tell them what the olpc IS! Got an email from the One Laptop Per Child Team letting me know that there’s a new version of the Sugar OS for the OLPC. That sounded kind of interesting, and they said, “it’s all new!” Sugar is pretty darn weird, not like any OS you’ve ever used before. The file system is quite odd, and it’s not any kind of “normal’ windowing system, like Linux, OSX, or Windows. “All new” might be fun and would give me an excuse to play with the OLPC since it’s pretty much been a bit of desk decoration for the last six months or so. But then I read on and discovered that they’ve made a version of Ubuntu Linux for the OLPC. Now THAT sounds like even more fun! I found the instructions to do this at olpcnews.com. I followed the link and I was treated to a torrent file to download. We haven’t talked about Bit Torrent on the show in more than a year so maybe I should give a brief refresher on what that actually is. Bit Torrent is a technology designed to allow a lot of people to download files much more quickly and to share bandwidth for the process so the originator doesn’t get their site hammered with excessive traffic. So here’s what happens. the originator has an entire copy of the file to be downloaded. The first person who downloads it gets the whole thing, and then starts sharing the file out to whoever needs it. The next person who downloads gets some bits from the originator and some bits of the file from the second person. Now fast forward to hundreds or thousands of people downloading – they all have different bits of the file downloaded and share out those bits while they grab bits from the other people. It sounds confusing but it takes advantage of the fact that each download person has much higher capacity to download than they do to upload, so each person can be downloading bits from many people while only uploading a small portion of the file. Large files with LOTS of people wanting them work really really well as torrents because there’s so much sharing opportunity. Small files don’t need the technology, and big files with only a few downloaders won’t work because there aren’t enough bits to be shared, or it’s really slow for the same reason. Linux is almost always distributed through Bit Torrent because the files are large and the community is strong in numbers, so I wasn’t a bit surprised to see that Ubuntu for the OLPC was going to come to me as a torrent. As an aside, many people use Bit Torrent to download video files illegally, and I don’t condone, support or admire that activity in any way. so it’s been ages since I actually did any Torrent downloading, in fact a laptop ago, so I didn’t have any torrent software on my computer. I headed over to Versiontracker.com and took a look for the application called Tomato from sarwat.netbecause I’d heard good things about it. Of course Torrent is free, and download and install was a snap. I double clicked the torrent file, it opened in Tomato, and in the time that I wrote this whole pitch about the OLPC and Bit Torrent the nearly 300MB file was downloaded. Next up, how the heck do I move this to the OLPC and install it? I took a look at what I’d downloaded and the file extension was .tar.bz2. Now tar stands for tarball I think, which I believe is like a zip file, it’s a bunch of files balled up into one. I’m experimenting here, so I figured, double click it, right? Sure enough the OSX archive utility launched and started to unarchive it. While that was extracting, I looked at the instructions. I was heartened to see such comforting sentences as “Installation procedure is pretty much the same as Hardy minus kernel/modules/firmware copying.” Oh yeah, good, I was hoping for that! The .tar.bz2 file extracted…into a .tar file! Ok, good news is the archive utility kept going and started extracting THAT file. oops, read one more sentence down and found the instructions to install right from the .tar.bz2 file if I throw it on a thumb drive. Cool! So I stuck the thumb drive in the OLPC and looked back at the instructions at olpcnews.com and I was completely baffled. I hadn’t a clue what I was supposed to do next. Ok, time to bother Bart! He took one look at these gibberish instructions and told me that the thumb drive is what the installation files go on, but I’m supposed to use an SD card (the kind of memory that goes in your camera) as the hard drive onto which I’ll install Ubuntu. I have NO idea how he figured that out but he did. so next day I went to the store and bought a 2GB SD card for next to nothing. I tried to follow the instructions but got stuck IMMEDIATELY. You have to be a root user to execute the instructions, but for some reason, sudo wasn’t working (which stands for “super user do”, which is a sort of short term rootness. Ok, Bart, what’s next? at this point we were ships passing in the night, him off to the lack of intertoobs, me off to San Diego and Fresno, but finally we got back to it on New Year’s eve. It turns out that this particular build of the OLPC s/w doesn’t recognize sudo, but will recognize su which means switch user and is commonly used to change to root. So I was back in business. As Bart was helping me, he’d ask me to type something, and the OLPC would splat some glop on the screen and I couldn’t send him what it was saying because I would have to type it into the chat on the Mac. I suppose if I were clever I could have figured out how to copy from the Terminal on the OLPC to maybe google talk in iGoogle over on the OLPC, but Bart had a better idea. He suggested I grab my iPhone and take a picture with it and email it to him. this turned out to not work very well because of a combination of poor lighting and the poor quality of the lens on the iPhone, but it did make Kyle laugh when he came in and saw just how many gadgets I was simultaneously operating! He grabbed my real camera and took a picture of my setup – I threw it into the shownotes so you could see just what it looked like to him! Evidently that makes the partition table on the SD card. Ok, whatever a partition table is, I’m sure I want one of those. We ran into a few more hiccups – like discovering that if my USB drive is in the lower of the two USB ports it will not mount (that wasted an hour or so of our time). But finally we got to the step where we got to tar all over that tarball, which I think caused the actual installation of Ubuntu onto the SD card, because it splat unixy gunk all over the OLPC screen for about a half hour! I was SO excited when it was done, and I typed in reboot…and nuthin’. Same old OS, no boot loader asking me which OS I wanted or anything. At this point it was about 3am for Bart and he suggested that maybe I should post a comment in the OLPC forum where I found the Ubuntu instructions. That sounded like he was weasling out, but with all things Bart he was right on the money. On Saturday i got a response from a guy saying that one teeny bit of info was left out of the instructions – that you need a developer key in order to do any of this kind of hacking of the OLPC. It’s not that they don’t want you to be allowed to do it, they just want you to not do it accidentally I guess? Now of course I have no business with a developer key, but you know this didn’t daunt me at all! It’s kind of interesting how you request one of these developer keys. Turns out there’s a file pre-loaded on the OLPC in the home directory who’s sole purpose is to let you request and pick up your key. Unfortunately it takes a day to generate the key, so all I was able to do was to do the request, and yet again I was stuck. and then copy that security key to the right place on the SD card and reboot, and…then it said “SDHC1 did not start up after 1 seconds” and booted into the normal OS again! ARGH! This next story is a convoluted one so stay with me. You know we do Chit Chat Across the Pond using Skype every week, right? And we do the Mac Roundtable using Skype too, right? Well, about a month and a half ago, I started having dropouts on Skype. At first I tried to assume it was someone else – you know how it is, you always try to figure some way it someone else first, right? Well it happened on the MRT first, but other people like Victor were dropping out too. But then it happened quite a few times over the next few weeks when I was chit chatting across the pond. The next time I was on MRT I mentioned that I might disappear, and chuck Joiner of the Mac Voices Podcast gave me the oddest advice. He told me to go into the Date & Time Preference pain and turn off the option to set the date and time automatically. this sounded like voodoo but Chuck’s a really smart guy, and I figured this was an easy thing to try and if it didn’t work I could just mock him, right? So we’re getting ready to record and I’m explaining the problem, Chuck says to turn that off, and as I reach to turn it off, I get disconnected from the call. made a humorous outtake for the show at least! Well anyway, to get us at least halfway through this story, I finally did get a chance to turn off the network time, and sure enough it fixed the problem! I did the rest of that MRT, and two episodes of Chit Chat Across the Pond, all without a single dropout. I couldn’t believe it – but I sure thanked Chuck for his help! So then I explained what I’d done to Bart and he said, “you won’t drop out but you won’t be prompt any more!” I said I could try to add to my workflow to turn the network time servers off before I start up skype and to turn them back on afterwards. Bart and I had just been talking about how he thought that Automator was going to really take off – that the common man would get into programming because of it, but it just didn’t seem to be taking off. When I described this workflow of turning the time off, skype on, skype off, time on, he said, “sounds like a job for Automator!”. Of course I didn’t even pretend that I was going to actually write an Automator script, that’s just the kind of thing I pretend to do. Don’t worry, we’re actually getting close to the point of this whole story here! So Bart wandered off to his friend’s house to watch Harry Potter on a 52″ screen, and I started chatting with Connor – frequent contributor and avid member of the chat community over on the live NosillaCast on Ustream. He was telling me this great story about how he and his family are actually connected to Alex Lindsay, the head of the Pixel Corps and a member of the Macbreak Weekly crew. He really wants to get a message to Alex about the family connection, and he knows how I like to bother people, so he asked if I’d try to get a message to Alex about the family connection while I’m at MacWorld next week. I told him that of course I’d try to do that, but that he’d need to remind me some time on Tuesday because I’d never remember. Connor didn’t make a noise in chat for quite some time, then suddenly re-emerged announcing he’d written an Automator script that at 3pm EST on Tuesday would automatically send me an email reminding me to tell Alex all about it! How cool is that? I wonder if you can see where the plot is going here yet? Here I am with a problem to be solved by Automator, and here I am with someone who knows how to write Automator scripts! Now all I have to do is figure out how to get Connor to do my work for me! Well all I had to do was tell him the story, then conveniently go off to wash Kyle’s car, and when I come back there’s a lovely tweet from Connor saying “come getz ur scriptz”! Sure enough, he’s written two lovely scripts for me – the first one launches the Time & Date preference pane, turns off automatic updates of time, then launches Skype for me. The second one quits Skype, and opens the Time & Date pref, and turns time syncing back on! All I had to do was save the scripts as applications, and now I can launch both scripts through QuickSilver, or put them in the top of all finder windows. Thanks Connor – you rock!!! Today we have special guests conducting our Honda Bob commercial – check this out! found nice photo of Holly berries in my iPhoto library, added a matte, exported, droppped in and scalled to fit exact hight of half a card. layout guides made it trivial to line them up. coppied and pasted 5 times and again, trivially linned it up with the guides. You read something on line, and it seems inflammatory – either amazing or derogatory. Do you assume it’s true and pass it along? How do you figure out if it’s really true? CNET now reports that NVIDIA has stated that the Inquirer is completely wrong – that the "bad bumps" are a combination of both the size of the bumps and the underfill. The Inquirer only found large bumps and assumed the overall problem was there, not noticing that the underfill had been changed. So bottom line – the MBPs do not have the failure issue. It was REALLY hard to find the explanation from NVIDIA, because everyone was quoting the original story. "nvidia macbook pro inquirer reply"
Email me at allison@podfeet.com, follow me on Twitter at twitter.com/podfeet. finally finished listening to this show on the way home today. I loved it. You and Bart are just wonderful. I think that is the part that I most look forward to, for sure. Interesting about the nVidia fiasco. I don’t know if I trust them, seeing they were initially in denial about the first chip problems….my older MBP was one of the ones that suffered from the problem. I just hope the replacement chips are indeed FIXED, as I would hate to go through this same problem after my Applecare is up. I TOTALLY loved loved loved the show. Will be listening to the newest one tomorrow!! !